See this in use at most area Panera Bread Locations. 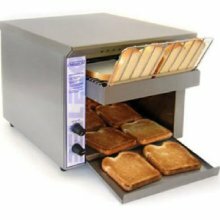 This Belleco 300 Slice/Hr Conveyor Toaster (JT1-H) has a 2 1/2" clearance that is ideal for toasting and warming bread, buns, rolls, bagels, waffles, pita bread, texas toast and English muffins. It is simple to operate, made in the USA and is safe for self serve operation. The 10 1/2" wide conveyor carries the bread through the machine at just the right speed for toasting. On/off switches are available for both top and bottom heaters. For applications requiring greater capacity, try the JT2 / JT3 toasters.